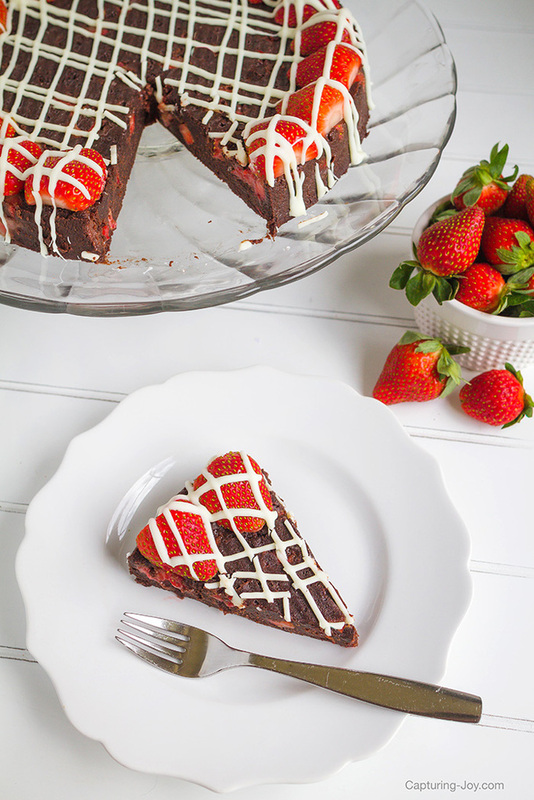 Strawberry Truffle Cake is the most decadent and delicious recipe. 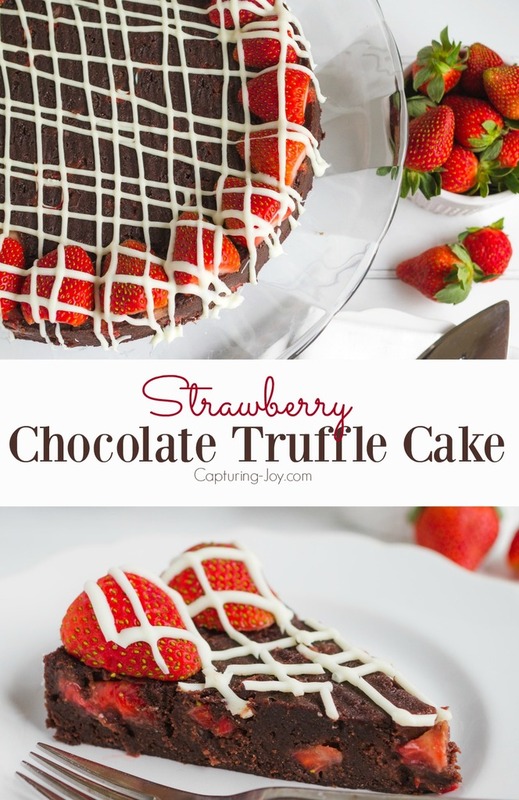 If you love chocolate covered strawberries, you MUST make this cake! A friend of mine shared this recipe with me years ago and it has remained a favorite of mine and my entire family. 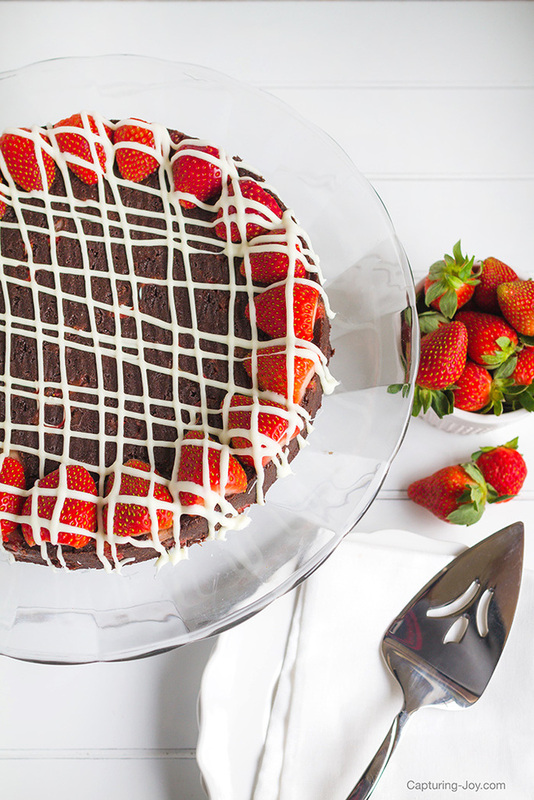 In addition to tasting amazing, Strawberry Truffle Cake uses simple ingredients. You probably have most of them on hand already! And it is really easy to make! I make it every year for Valentine’s Day! You start by baking a boxed devils food cake according to the package directions. Then you let it cool completely. Next you make a simple ganache by heating up cream and butter and pouring it over chopped chocolate until it is nice and melted. Once the ganache is ready, you will combine the cake, ganache and chopped strawberries to create a rich chocolate strawberry truffle cake mixture. This will freeze in a springform pan for about 45 minutes. Then when you pull it out you can garnish it with strawberries and melted white chocolate drizzle! 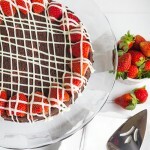 You will have a beautiful chocolate strawberry cake that everyone will love. That is if you don’t eat it all yourself before sharing with your valentines!! Make box cake mix in a 9x13 pan according to package directions, then let cool completely. Once the cake has cooled, chop the bakers chocolate and set it aside in a large bowl. In 2-quart saucepan, stir whipping cream and butter over medium heat until butter is melted and mixture comes to a boil. Then pour cream mixture over chopped chocolate and stir until smooth. Line bottom of 9-inch springform pan with waxed paper round. Cut cake into 1-inch cubes. In large bowl, beat half of the cake cubes on low speed until cake is crumbly. Then add the remaining cake and 1 3/4 cups of the ganache (reserve remaining ganache for topping). Beat on low speed 30 seconds, then on medium speed until well combined (mixture will look like fudge). Fold in 2 cups of cut-up strawberries. Run knife around side of pan to loosen cake. Place serving plate upside down on pan; turn pan and plate over. Frost side and top of cake with the remaining ganache. Arrange strawberry halves on top of cake. In small microwavable bowl, microwave baking chips and 1/2 teaspoon oil uncovered on High 45 seconds, stirring every 15 seconds, until melted. Place in small resealable food-storage plastic bag; cut off tiny corner of bag. Drizzle over top of cake. Refrigerate until ready to serve. Cake is best served the same day.